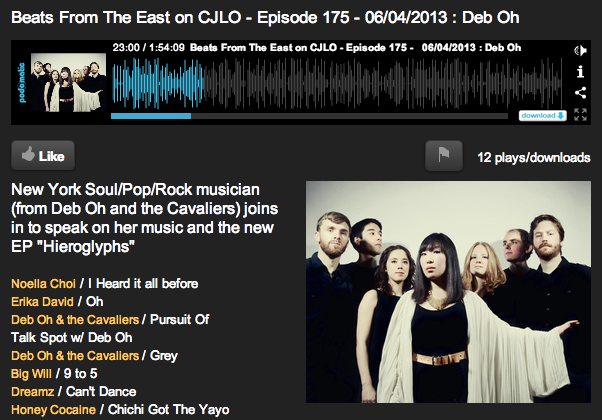 Deb chats with DJ Mister Vee from Concordia University's CJLO Radio about 'Hieroglyphs'. On heavy rotation: "Hieroglyphs", the new album from New York City-based band Deb Oh & the Cavaliers. I was a big fan of Deb's solo EP, Cold Glory, but the soulful, epic force of Deb's vocals plus a seven-piece indie-pop orchestral collective takes her sound to another level. I first listened to Deb Oh & The Cavaliers as part of my 365 Days of New Music project and immediately liked their EP, Cold Glory. Featuring sweeping strings and lead singer Deb Oh’s intricate piano and strong vocals throughout, this EP has been in heavy rotation for me. Their new EP, Hieroglyphs, features much of the same, but it feels bigger, with surprising twists and turns as the band experimented with new sounds and styles. One constant between songs is catchy hooks and repeated chants which you’ll find running through your head long after you’ve listened. Some new music for you… Here’s the very first music video by New York City-based indie pop singer/songwriter Deb Oh & the Cavaliers, for her awesome orchestral ballad “Primacy.” Great song. Featuring all seven members of the band, the video was apparently shot in a freezing warehouse with no heat in the middle of December. Like the song? The track, from the upcoming Hieroglyphs EP, is available as a free download from Bandcamp. You can also watch a behind-the-scenes look at the making of the music video. I was a fan of Deb Oh’s previous solo EP Cold Glory from a couple of years back, so I’m looking forward to picking up the new album with the full band. They’re currently raising funds for the album through PledgeMusic. For further information about Deb Oh & the Cavaliers, check out the band’s website. For Deb Oh & the Cavaliers‘ very first music video they chose the sweeping percussive ballad, “Primacy,” and friend-sourced the funding to produce the shoot themselves. A native born Alaskan, Oh, wanted to feature each of her seven New York based Cavaliers individually, performing in smokey black and white, for a sense of timelessness — shared by the orchestral song. We call “Indie Pop” Pop music for the sophisticated minds. This genre achieves it’s “pop” status through melodic quality and uptempo bpm, while maintaining an “indie” edge through mild sonic experimentation and careful avoidance of cliches. The bands who submitted in this genre deviate from the mainstream with their unique sound and talent. NYC’s Deb Oh and the Cavaliers have constructed a beautifully orchestrated track called “Crescendo” that I hope you Shufflers will enjoy as much as I do. Deb Oh’s vocals lead the way through the thick waves of instruments that delicately prance around her milky tone. As soon as I heard this song, I was reminded of Norah Jones. There’s an infectiously calming effect that this song projects so soothingly. While there are a lot of instruments to account for, the execution of them as a whole is still soft and gentle on the ears. This track is truly a modern take on an easy-listening orchestral indie song, with a tinge of soul. “Crescendo” is taken from the band’s Cold Glory EP, but don’t forget to make note of Deb Oh and the Cavaliers’ Hieroglyphs EP release this coming February. It’s their first official EP as a band, and I can’t wait to hear what they’ve got up their sleeves. Stay tuned!